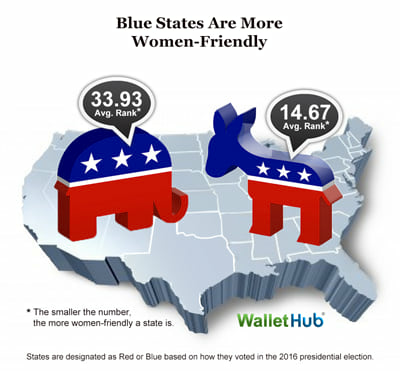 In this week’s Map Monday, we consider the best and worst states for women by considering a study recently released by WalletHub, a personal finance website, which considered median earnings for female workers to women’s preventive health care to female homicide rate for a total of 24 metrics on the 50 states and D.C. The Peach State came in at #39. * The District of Columbia has the highest median earnings for female workers (adjusted for cost of living), $34,417, which is 1.5 times higher than in California, the lowest at $22,508. * The District of Columbia has the highest share of women who voted in the 2016 presidential election, 77.2 percent, which is 1.6 times higher than in Hawaii, the lowest at 49.3 percent. * New Hampshire has the lowest share of women living in poverty, 8.9 percent, which is 2.6 times lower than in Mississippi, the highest at 23.5 percent. * Alaska has the highest share of women-owned businesses, 22.87 percent, which is 1.6 times higher than in South Dakota, the lowest at 14.04 percent. * Massachusetts has the lowest female uninsured rate, 2.3 percent, which is 7.6 times lower than in Texas, the highest at 17.5 percent. See the rest of the study here.